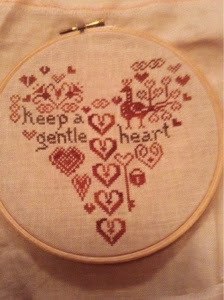 I have managed to finish the stitching of Cinnamon Hearts by Threadworks Primitives. I just need to make it up, the kit came with everything to finish it, I do not need to touch my stash. A pretty finish. Looking forward to seeing it fully finished.